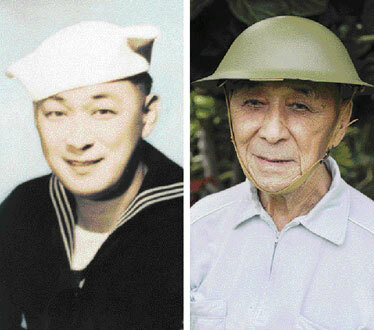 Allen Kim worked in the Pearl Harbor Naval Shipyard for 34 years. Kim is pictured as a petty officer 1st class in the Seabees, at left. He poses, at right, at his Mililani home with his World War I helmet issued to him on Dec. 7, 1941. For more than three decades, Allen Kim was a part of the work force at the state's largest industrial employer -- the Pearl Harbor Naval Shipyard. "I was there during the period of tremendous growth," Kim, 88, recalled recently, "especially after the attack by the Japanese." Following the devastating Dec. 7, 1941, Japanese attack on the Pacific Fleet anchored at Pearl Harbor, "the shipyard expanded like mad." Kim added. "There was tremendous building and tremendous expansion." "We were working seven days a week -- on two 12-hour shifts. Later during the war we got every eighth day off." Between December 1941 and August 1945, shipyard workers repaired or returned to service more than 7,000 vessels. Following the Japanese attack, the shipyard was able to return 18 of the 21 warships damaged by the Japanese to battle. 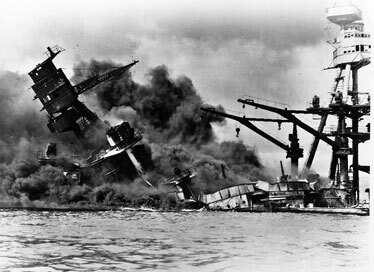 The USS Arizona sinks in Pearl Harbor after the Dec. 7, 1941, surprise attack. Today, more than 4,700 civilians and sailor are employed at the shipyard, which will celebrate its 100th anniversary on Tuesday. A week of celebratory events is planned for this week, starting with a historical symposium beginning at 7 a.m. tomorrow at the Ala Moana Hotel. On May 13, 1908 Congress approved legislation that established a Navy Yard at Pearl Harbor, which resulted in a small coaling and repair station. The shipyard today is the largest ship repair facility between the West Coast and Asia. Three years ago, Pearl Harbor narrowly avoided attempts by a few congressional leaders to add the shipyard to the list of military bases slated to be closed by the 2005 Base Realignment and Closure Commission. However, a year later during an inspection visit Navy Secretary Donald Winter told reporters that the Navy is "committed to maintaining Pearl Harbor Naval Shipyard." By the close of last year, the shipyard was preparing to receive the latest nuclear attack submarine -- the USS Hawaii -- which will be the first of three Virginia-class submarines that will be stationed at Pearl Harbor. The 377-foot USS Hawaii, USS Texas and USS North Carolina will arrive in the islands next year. Kim joined the shipyard's labor force in 1938 after graduating from McKinley High School and Honolulu Vocational School, now known as Honolulu Community College, which today has a highly competitive apprenticeship program for potential Pearl Harbor workers. Except for two years during the Korean War when he volunteered to be a Navy Seabee, Kim worked as a shipbuilder at Pearl Harbor until he retired in 1974. Kim was 14 when he entered McKinley. He decide to change his last name from Cha Soon to Allen in honor of Star-Bulletin editor Riley Allen, who led the newspaper for 48 years, from the time the Evening Bulletin and Hawaii Star were merged in 1912 until 1960. "I really admired that man," said Kim. When the Japanese fighters bombed the Pacific fleet Kim was living in Kalihi near Libby Cannery. "I caught the train at 8:30 that morning," Kim added, "and got to the main gate just before 9 -- about the time the second wave was coming in. " "I ran to the shipfitters shop. There were five light cruisers, including the USS Honolulu, berthed near the building. Their guns were blazing. ... I looked up and I remember seeing silver-colored airplanes." Kim said he was given a helmet and told "to find a safe place." He still has that World War I doughboy helmet. Workers from his shop were called out to rescue the 32 sailors trapped in the overturned hull of the battleship Oklahoma. "Those civilian workers still have not been recognized for what they did," said Kim. "They risked their lives." Kim said other civilian workers have been awarded battlefield medals and Purple Hearts for their efforts on Wake Island and Hickam Air Field during the 1941 Japanese attack. "I am still hoping the military will recognize these guys." Kim recalls watching shipyard workers repair the battle-damaged aircraft carrier USS Yorktown in less than 48 hours, allowing it to participate in the Battle of Midway, considered to be the turning point in the Pacific War. "When I started out working at Pearl Harbor, I was making 36 cents an hour," Kim added. "I would get a raise to 12 cents an hour every year. I thought I was rich when I became a journeyman and was earning $1.05 cents and 6 mils (1 mil is one-tenth of a cent) an hour."